I have children with special needs. Hearing loss, heart defect…those don’t cause people to raise an eyebrow. A murmur of sympathy for my son who has endured heart surgery? Yes. A few polite questions about hearing loss? Sure. Judgment? No. But what about other special needs? Try telling someone your child was born addicted to cocaine. Or suffers from FASD (Fetal Alcohol Spectrum Disorder). These will get you a different reaction entirely. First off, there is the judgment of people looking at those children and always viewing them as “drug babies”…and then there are the ways these effects manifest themselves. Namely in behavioral issues and impulsivity. Add in a few labels like “attachment disorder” and “oppositional defiant disorder” and suddenly my children are victims of my large family. They are just crying out for attention. They don’t get enough love and nurturing at home. Never mind that their siblings without special needs and their siblings with hearing loss and heart defects don’t display the same symptoms. This week I get to talk to the principle of our local elementary school about the behavior problems of one of my kids. About how this child is behaving dangerously on the bus. Bi-weekly I get to sit with a counselor and discuss how no, her suggestions from our last visit didn’t work either. We have yet to find anything that will stop our raging, aggressive child once s/he gets started. 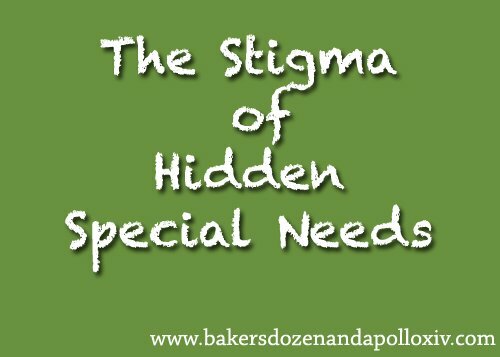 These are special needs that still come with a huge stigma. It makes me happy to know that my children are growing up in a society that sees the inherent value in people with Down Syndrome, people in wheelchairs, people with any number of disabilities. I am so glad that things have progressed from when I was a kid in the 80 ‘s and many of these children were still hidden away in separate schools and classes. But my mom heart longs for a day when my special needs children get the same respect. When people understand that prenatal drug and alcohol exposure has a devastating effect on kids, yet they are still valuable. Still loved and cherished.They are beautiful and healthy. My children’s special needs display themselves in negativity, disobedience, rages, and aggressiveness. Add to these behaviors learning disabilities and you can probably see how much my children have to contend with on a daily basis. My children struggle, and it’s not their fault. They were not the ones who chose to consume drugs and alcohol before they were born. Their special needs were entirely preventable. Ten years ago, I would have severely judged a mom whose children behaved like some of mine…But now I know better. Now I am the mother of children whom I love with all of my heart…who often display behavior I can neither control nor explain. I want the best for my children…I want them to grow up happy and healthy. People who love God and have a desire to serve others…to make the world a better place. But some days it’s a struggle just to get my children to take a shower. Or sit at the table for a meal. Or be comfortable hearing, “I love you”. None of this changes my love or commitment to my children. All I ask is that you think twice before judging children and their parents. Perhaps they have a hidden disability. Perhaps that behavior isn’t caused by poor parenting or a large family. How about giving that mom a smile? Offering to hold an extra bag. Letting her know it’s okay. Let’s all work together to make our world an even better place. I totally get this Renee. I have a grown disabled “adult” child who will always have the learning abilities of a teenager – does this make him any less loved? NO – is it a challenge – definitely YES but we work with it. And add to that an adopted granddaughter with a genetic disorder and Sensory Integration Disorder – when the sensory overload goes into overdrive it looks like a 3 year old having a royal temper tantrum and others look at her as misbehaving and what is wrong with me that I let her act that way in public. I know her frustrations and I know the methods of letting her work through it…….do we stay at home so as not to subject others to this behavior…NO – she needs to learn how to cope with the frustration and learn to regulate it – and that only comes with living in the “normal” world of frustrations in every day situations. Do we love her any less……no…….we love her more and help her learn. Thanks so much for your very insightful post. It really resonated with me the part about staying home. I used to keep my son at home. I was always afraid of what others would think or if I could control him on my own. I wouldn’t or couldn’t even take him to family get-togethers on my husband side if he was working that day. Then one day I read a book about a lady with a child with autism. They were basically living as hermits. She was a single mom.. Suddenly she decided what was the worst that could happen. And she started to take him places and yes there were horrible tantrums and meltdowns and things of that nature but they were getting out and experiencing life. That book totally changed my outlook on things. Like you said how could he ever learn to grow if he wasn’t given the opportunity in the situations. Mind you when he was young his impulses were just too great and he really had little control. But no if we say not to do something or that we are not stopping somewhere on the way home he does still grumbling get irritated but that it doesn’t turn into a full on anger fest. I can remember a time being at the pool when my son was about 7. He was splashing like any other kid and being a little boisterous. A couple people were giving dirty looks. However there was a child with Down syndrome who was doing much more than my son was. Diving under the water pulling on people’s legs even though being asked not to, splashing, pushing …and parents were just giving him a nice little smile. I remember that day thinking how my son special needs truly were hidden. We often kept Mordecai home when he was younger, but it was for his sake. He would get so overstimulated and miserable. We do still keep Avi from certain events/places knowing that she would be miserable there…This will fade as she gets older, I am sure, just as it did with Mordecai. He is better able to cope with loud/chaotic places and events. oh same here. P could never go say to a movie. Way too loud. or indoor putt putt with music….we leave family gatherings early if a certain cousin is there acting up and his mom is not watching his behavior…its a blessing as he gets older he can tell which things are too much in advance and not get jealous all the time if I take other kids. Yep, this has been us too. Movies in particular. So much stimulation, and he doesn’t like any movie where he doesn’t already know what’s going to happen. He wouldn’t talk or eat when we went out when he was little – fun times. Mine has a Sensory Processing Disorder and ADHD (PIP). We’ve seen a sensory OT and done listening therapy with him, which made an amazing difference for taking him places. Just incredible. We now medicate for ADHD which apparently qualifies me for the worst parent of the year award. The thing is, the medication works for him, and has changed his life, particularly his schooling. So I’m not apologising for it at all. And when I ask him if he would prefer not to take it he very clearly says “no” – he wants to stay on it, because he notices the difference it makes. Sold! I have 2 young adopted children, one with cerebral palsy due to abuse as an infant and one with severe ADHD and probable FAS and the judgement I get when out with them is huge. I try to explain that they both have damaged brains and still get the message that I am just not being consistent. Two of my children struggle with the same effects cocaine and alcohol have on them. Rages, anger, disobedience etc. Etc. And I also would have judged as well. One child is on medication to help her cope (Abilify and Kapvay) and my other child isn’t on any medication yet. He may or may not need it. My daughter sees a FAS doctor for her needs. Her meds seem to work only for a short time then we are faced with more descions on what medication might help her next. I agree, a smile or a helping hand could brighten a struggling mothers day. EXCELLENT post! May I repost this on my blog talesfromourhouse.blogspo.com ? I will give you credit. Sandra- I would be thrilled to have you post it (credit and a direct link to the post would be appreciated). This blog post has been floating around in my head for months and finally made its way out this morning. I was just going to say they also have the right to terminate which is ending a baby’s life. so drinking falls far beneath that as far as a lot of states are concerned. Renee, I hope it’s okay to share a different perspective in answering the question of why mothers arent punished for exposing their child to alcohol/drugs in utero. If you don’t want argument/debate on your blog, I completely understand. I thought I would try to share anyways. I consider this from a place of knowing that most women who expose their baby/fetus to drugs or alcohol are addicts, which I believe is a form of mental illness. The difference between a mother who feeds her 1 year old vodka and a pregnant woman who does cocaine is that the pregnant mother is trying to consume (smoke? snort? I dont even know) the substance for themselves because they are suffering from addiction. They aren’t setting out to directly give something to their baby. I think that addicts need compassion and treatment, not jail time. I would think, given the fact that she chose adoption, a birth mother addicted to drugs (like Avi or Mordecai’s birth mothers) probably did not intend to get pregnant in the first place. Probably they were already addicted before they became pregnant. I would rather that birth mother have the option to come forward and say “Hey, I am using cocaine and I am addicted, but I am pregnant. Can you help me get clean so that I stop exposing my unborn child to drugs?”. I would rather treat that birth mother and hopefully get them off drugs, support their prenatal care so that the child has the best chance of being born healthier. If instead, the policy is to put that mother in jail for exposing her child, no pregnant woman is going to come forward to ask for help because they know they will face criminal prosecution. Instead, that pregnant mom is going to hide their addiction, continue using drugs (because theyre addicted), and their child will face 9 months worth of exposure. I don’t think that is a better policy choice because it encourages addicts to hide their problem rather than seek treatment. My opinion is that if one is going to oppose abortion, then they need to support pregnant women no matter what. That means having compassion for addicts and supporting policies that give their unborn children the best chance possible. Just my opinion. Hope it was okay to share a different perspective. Meghan, thank you for sharing your opinion. I wasn’t trying to say I personally thought women should be convicted/tried/locked up for exposing their unborn babies to drugs or alcohol. I was simply trying to answer honestlyamy’s question. I agree, punishing these woman isn’t going to solve the problem. I have utmost compassion for women addicted to drugs/alcohol. I know they would not be using these substances while pregnant if they could “just quit”. I also completely agree that if people are pro-life (as I am) they need to support pregnant women and their babies no matter what. Love this!!!!. We are always referring to my son’s toolbox. Sometimes my daughter will flippantly say “oh he has ADHD he can’t help it.” I remind her and my son that no we might not be able to cure his ADHD,but we have many tools in his toolbox for helping him with his feelings and emotions. If your child has the MTHFR gene mutation, he will need folate as opposed to folic acid. Please look into this. I have 11 adopted children and it has made a HUGE impact to put them on B complex with folate (folic acid can not be listed on the bottle). It’s been HUGE, HUGE, HUGE. It has drastically reduced anxiety, irritability, and fatigue. 40 percent of the population has this mutation, so it’s worth looking into. Im sure if every adult and child could choose their life circumstances, they wouldnt pick to have an illness of any kind and they sure the heck wouldnt pick the circumstances of how they got their illness. Just remember, only you can advocate for your child. As an adult, only I can advocate for myself… Encourage your children to hold their head up high and to remember you will always be on their side. “My four year old is smaller than that!” (but is he tubefed to maintain that weight?). I have a child with a rare genetic disorder, and we were having a very similar discussion to this on a site for rare chromo children. The conclusion that we agreed on was to smile and let the mom know that you understand when she is out in public with a child having trouble. Even if the child is just ill behaved, the mom could use encouragement, not condemnation, and we never can know what is going on behind the scene, behind the fit! Amen. Only two kids in our (adoptive) family, and one suffers from insecure attachment, and the effect of the trauma of his early life in a very poor orphanage. He suffers from similar issues. I was humbled early and learned not to judge, but I know I am often judged by others who see only a bright almost 12 year old acting “inappropriately” or “below his age”. Yes, family size has NOTHING to do with attachment. Thank you for sharing this. Your perspective in a small family is helpful. Oh Renee, I know I’ve been on both sides of this! Learning to extend grace, and needing to receive it. I’ll never forget the elementary school principal smugly telling me that my son wouldn’t have _____ if only we had more consistency at home. Julie- Mordecai was diagnosed at UW when he was 2.5 🙂 The counselor loves to point out Mordecai’s “large family” as causing and making his issues worse. Umm…living in a small family does NOT undue the effects of FASD. Even though we only have five just adopted children I often feel like people are judging us to like why are we adding more children to our family when our son has a special needs. I think since we adopt especially. It’s not like we’re throwing caution to the wind and putting it in Gods hands as far as how many children we have.no. we actually have to sign up with an agency put a lot of money up and wait to be chosen by a Birthmom to adopt. So I think people think it’s a little nutty. Nobody has been so blunt just to tell me that that our family size is the reason our son has special needs. But people have questioned if adding more kids is exasperating his symptoms. In our case I think having loving siblings who love him unconditionally is a great thing. My children also are learning Grace patience and sensitivity from their brother. I wouldn’t go as far as a say it’s a “win-win. ” But he was a handful when we only had him. I can totally relate on so many ways to this, only I have never parented a child with prenatal damage from drug/alcohol abuse. I do parent two children with Down Syndrome so I know first hand that things are changing as to our society accepting them for the special people that they are. But I have also parented and am parenting children with severe dyslexia and un-diagnosed learning disabilities. To parent a child with dyslexia in a home schooling community is to learn to deal with judgment. If this child had been in school, s/he would have been in special reading classes (I’m assuming) and then most of those s/he interacts with would be aware of his/her need for extra help. But when you homeschool such a child, anything they write or are asked to read in a group immediately causes judgement – his/her parents are lazy or not actually home schooling. I even had one person tell me that there comes a time to put away coloring books and get on to doing “real school” – she had no idea of the years I had worked to teach reading only to find it impossible….until we hired an expensive tutor and worked with them for 2 years to enable this child to do what other children do naturally. I have seen my children (I have three with dyslexia) exposed to ridicule and myself blamed for their lack of reading and spelling skills. It hurts. It hurts to know that others don’t take the time to understand. It hurts to know that others think I am doing a poor job of educating my kids. But I know that these children are overcomers and have worked harder than any other typically developing child to get to the place of being able to function in our society, get a driver’s license and a job….they don’t need other’s to judge them. Not one person who has noticed that one of my children is challenged when it comes to reading or spelling has offered to help, or even asked about it….nope, just assumed they were not properly educated. One person whom I had previously highly esteemed actually forwarded an email to someone else (at least they had thought they had) and added a note to the intended recipient something about “how embarrassing it this?? ?” – come on, let’s grow up and have compassion and understanding and maybe take the time to see/learn what the real problem and be a part of the solution. Amen and amen. My DD has 2 “invisible” issues and I so understand this post! I would also add that our society continues to treat poorly anyone with any mental disorder. SO unfair. Yes, this is very true about mental disorders. Beautiful post and great reminder. Thank you! AMEN sister! When my son was younger and the only signs of his disability (FASD and schizophrenia) were behavioral I became so incredibly tired of the well meaning (but ignorant) comments that all M needed was _______ (fill in the blank: more discipline, less discipline, a “whupping”, etc) and it would set him straight… it was all I could do to be civil sometimes. Honestly, i think it was during those years that I lost virtually all my confidence in traditional mental health care… it seemed to be all about blaming… totally missing what M (and the rest of us) really needed. I have lived with depression, anxiety, and mild OCD my entire life, and my 10-year-old son has displayed similar symptoms since he was a toddler. He is a perfectionist and while he doesn’t lose control in public, any perceived “failure” on his part leads to attempts to hurt himself and to destroy his most beloved possessions. He blames himself and feels like this is his fault. Just last week I read an article about how researchers in Chicago are developing a blood test for depression that once approved will hopefully make testing for depression as commonplace as testing for high blood pressure or high cholesterol. I cried tears of joy to think what effect his might have on the stigma that so many of us feel. I could have written this post. It is tough when people keep suggesting all the things you need to do better. Renee, I completely get it and I am a mother in the same bought with two children adopted from Liberia. I often feel off they had a special need like down syndrome people would not be looking at us as bad parents but parents trying to do the best we can with two children who had a terrible start to their lives. Hang in there! There are some of us out there that get it. Thank you so much for posting this. We have six kids – 2 biological and 4 adopted. Among our kids we have ADHD x3, Complete hearing loss in one ear, autism spectrum, fetal alcohol, RADS, OCD, ODD severe pragmatic speech issues,, and mental illness that is not defined with a label. We also are a licensed therapeutic foster family so we are often adding other things to the mix. We are blessed because our kids’ Medicaid in our state has so far paid for counseling and treatment without too much of a hassle. The problem is, medications and therapy can help, but there is no quick and easy cure. It takes a lot of time and a lot of hard work – and even then, things may never be “normal.” One of the best things I have done is take a class called, “Circle of Security,” offered by the Ainsworth Center for parent/child attachment at the Univ. of VA. It really didn’t teach me any new “tricks,” for dealing with behaviors but it did help me understand why some of the behaviors were occurring. 3 of my 4 adopted kids were in foster care for 2-4 years each and they have significant trauma histories as well. All this to say that your post really resonated with me. All we can do is keep on keeping on and trust God to take care of what we can’t. I taught grade school level special ed and had a good deal of experience with “drug” babies and FAS children who were lumped into a circle that said special needs. I had a young girl who suffered from profound autism and had a seizure disorder. Her aides chastised her and treated her poorly and I called them on it. I told them every time she had a seizure, another part of her brain was frying out. She had no control over them and even with meds she still seized. I had children who acted out sexually at age 6 and 7. I reported it and asked the counselor if the family had been investigated, kids act out what they’ve seen, and he’d seen a lot. I truly loved those kids and hoped that as they went into higher classrooms they’d be treated well. I know that you will fight for your kids and do the right thing. Completely off topic, but whenever I read your blog on my phone, the entire screen is often covered in bars of ads. I understand that you want to have advertising, but this makes it very difficult to read/scroll without clicking on the ads and being sent to another page. I can send you a screenshot if you want, but just wanted to let you know. Thank you, I had no idea…a screen shot would be great! Hey, I was talking about this post with my husband and he had a great suggestion. You should play a game of “SHOW ME THE SCIENCE” with the counselor. It goes like this “Show me the science that proves these behaviors are linked to large family size.” Then you casually say, “Oh and while your at it have you actually looked into the studies on attachment, impulsivity, and rages that do in fact exist with drug exposed children and FASD?” Corner her a little, put her on the spot. I bet you will find that what you suspect is true, she is being LAZY and PREJUDICE. My husband suggests that you definitely use the words PREJUDICE and DISCRIMINATION when talking to her. At the very least that may make her a little more careful around you. I might possibly make her do her job correctly and actually try to help not accuse. I like this! Show me the science! And you know what else you find in large families? Loyalty! I remember once, a long time ago, my son (who was Kindergarten aged at the time) accidentally cut in line in front of Mordecai (who was six I think) when they were at some Cub Scout function. Shane is such a space case that he had no idea, but Jubilee narrowed her eyes and stepped out from behind Mordecai and said, “Don’t you DARE cut in front of my brother!” Shane was surprised and realized where the end of the line was, but I was like, “That Jubilee, she is one great sister! Look at her step up and defend her brother! I want my kids to be like that!” And they pretty much are. My oldest had diagnosis of RAD, ADHD and ODD, now we only see the ADHD, he is a different child, he is loving and affectionate and rarely do we see a tantrum anymore, use to be weekly now they are 6 months or more, we did Nuro-feedback, and cut out Dairy and Wheat, what a difference 3 years have made, I highly recommend the Nuro-feedback and some Ig blood tests to check for allergies, regular blood test will not show anything. We put our family on the GAPS diet to heal the gut and have had tremendous success with behavior problems. FOOD ABSOLUTELY MATTERS!!!!!! I use to be that judgmental mom as well. Not anymore Sometimes God grows us and stretches us in the most unexpected ways! AMEN to all of this! It is time for moms to stop tearing each other down and start uniting and building each other up. If we spent as much energy trying to help children with special needs—regardless of what those needs are—as we do judging the children and their parents, we could certainly make a positive difference. Having a special needs child who appears ‘normal’. Sorry, that word makes me cringe, but you know what I mean. I totally hear what you are saying. Our son doesn’t have disruptive behaviour, which makes it slightly easier on us, but people are still quick to judge. When he was younger and we didn’t know there was anything different about him, I was judged as being a soft Mum…Even by my own family and my husbands family. They thought he was like he was because I molly coddled him, even though we had a daughter who was what they would consider ‘normal’. Since Greg’s has been diagnosed with several disorders, no one has ever mentioned that maybe they were a little hard on me when he was younger. I realise that people judge because they know no different and rather than except peoples differences, they are made uncomfortable by someones differences and look to point the blame. Those people who look down their nose and judge are not worth worrying about (if I repeat it I will believe it!). Raising awareness is the only way for people to learn about special needs children and adults. I remember reading an article a while back about a Mum with a child who was unable to walk any distance without having to rest or be carried, due to a disorder she had. The Mum got so fed up with people judging her for putting her child in a pushchair that she actually made cards to give to people about her child’s condition and in doing so made herself feel better and taught a few people a god life lesson…Don’t be too quick to pass judgment. Found your post on the #SHINEbloghop and I am so glad I did. This is such a powerful post and I’m so thankful you wrote it. I could totally relate to every single point you made. I too would have judged these types of situations — before I was parenting children with these needs. Now I have a completely different level of understanding. You are welcome! Yes, I used to judge many parents…now I’m too busy with my own kids to even notice 🙂 And if I do notice, I just offer a smile.